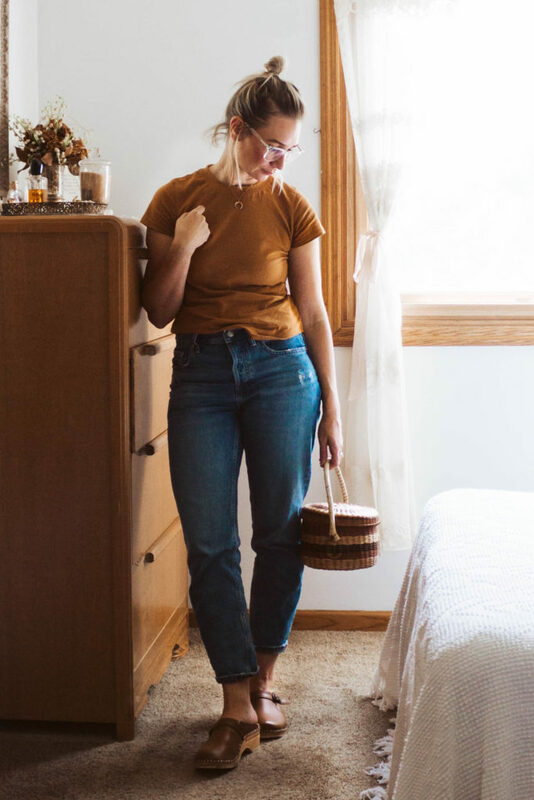 :: Outfit formula: Linen, more linen, and clogs! :: Why I put it together: we had one final (hopefully) super warm day, and all I wanted was linen! This linen tee is one of those pieces that I always think I should get more wear out of, but I just don’t reach for it that often… but when I do wear it, I really love it. I think that’s okay. 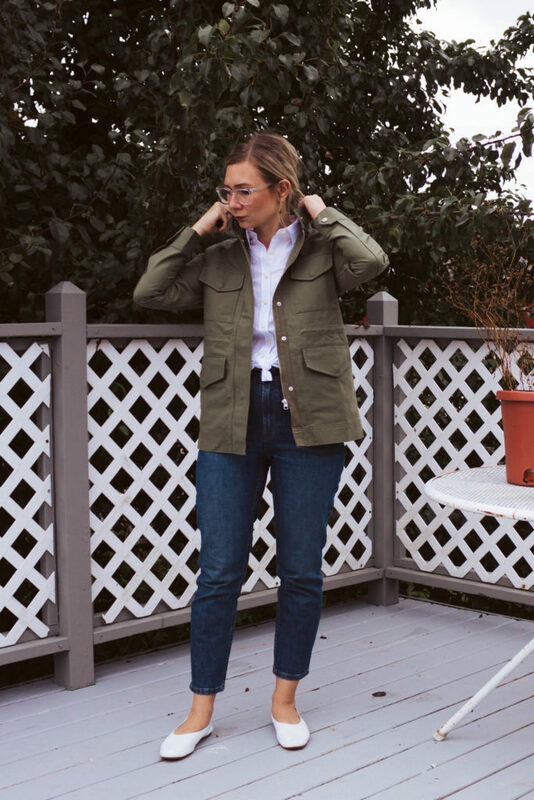 In a minimal wardrobe it’s good to have clothing that’s versatile and that you love enough to wear all the time, but it’s also okay to have pieces that save for the right occasion. When I first went through my big purges of clothing I made the mistake of getting rid of pieces like this (one of the reasons why I’m changing my mind about the validity of these kinds of purges), and I’ve regretted that. A big lesson I’ve learned in the capsule wardrobe process is: slower is better. 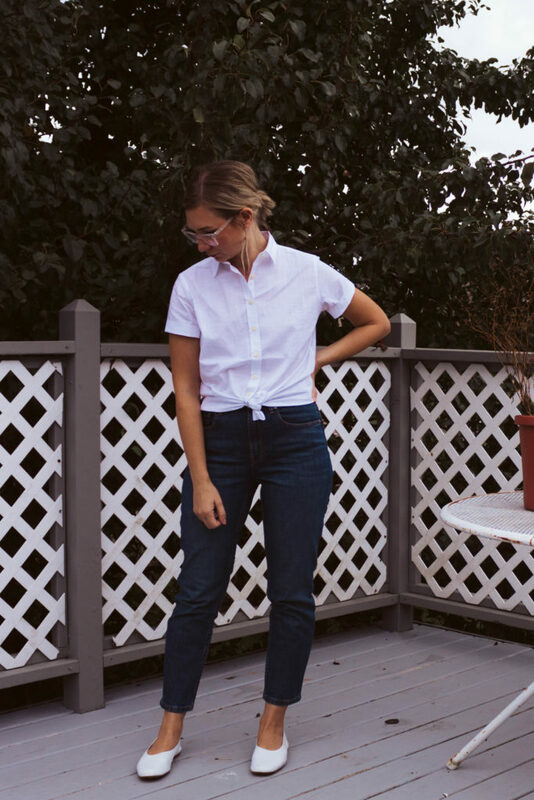 :: Why I put it together: I love the simplicity of this outfit… but the bookend white, and the dark denim give it just enough interest to make it not basic. Also, it was cool enough to wear a jacket! I mentioned this last week, but I’m leaning towards more simple outfits lately. I wrote this on Instagram last week, but just in case you missed it there: After realizing that I can actually throw out the capsule rules, and own more than one of the same type of thing, I’ve realized my happy place is firmly in the basics and neutral camps. Give me a tee, and a vintage pair of denim, and I’m set. I think we often struggle to figure out our own personal style because we let too many external influences override our instincts. But as I’ve grown more confident in what I like, I’ve found I naturally tune out those voices that tell me I should dress in x,y,z way. It makes getting dressed a whole lot more fun! :: Where I wore it: story time, and to get my hair cut! :: Why I put it together: Are you getting bored yet? Because it’s more of the same! Simple, easy, and hair that needs a good washing! 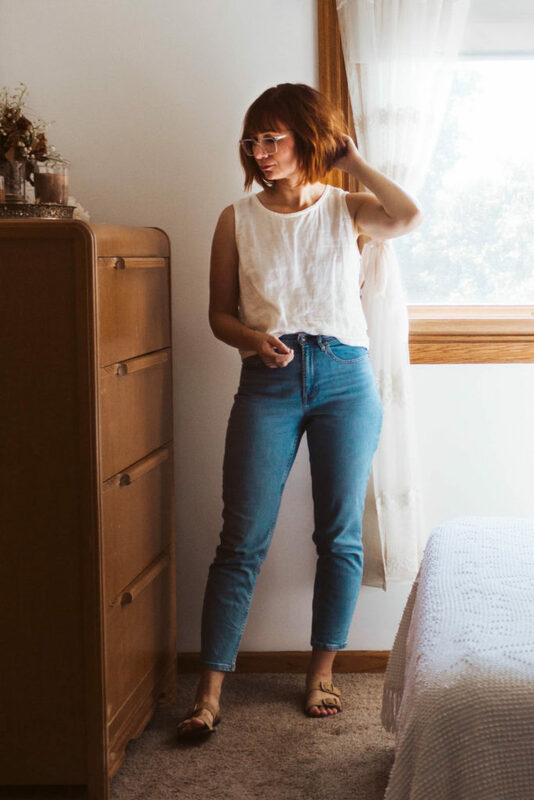 😉 These jeans are the new Everlane relaxed boyfriend jeans. To be honest, I wasn’t that interested in them until I saw this wash. It’s unlike anything that I have in my closet, and it’s really similar to a vintage wash. And I was pleasantly surprised with them! I had been missing a true boyfriend style in my closet, and it feels good to have a pair again. These jeans are really soft and comfy, and they hit mid rise which is a nice relief after all of the high rise pairs in my closet. I like the light distressing on them, but I appreciate that the knees aren’t ripped out. I chose my true size because I did want them to have a relaxed fit, and I’m glad I did. I don’t think the hips would have fit in a smaller size because they are just slightly narrow. If you’re looking for a boyfriend fit, these are a good pair! :: Why I put it together: This combo is as basic as it gets, and I’ve worn a form of it so many times this summer. It just works for me… I love how effortless it is, but because of the cut of each individual piece it looks like more than it is. I’ve also been really into this color combo: white, light blue denim, and tan. I think I’ll be revising this combo for fall with sweaters and boots! :: Outfit formula: Linen, more linen, and heels! :: Why I put it together: I made this skirt! I’m still in that sewing phase where I get super excited about anything that I make because it still feels really novel. But this skirt is a massive winner for me! 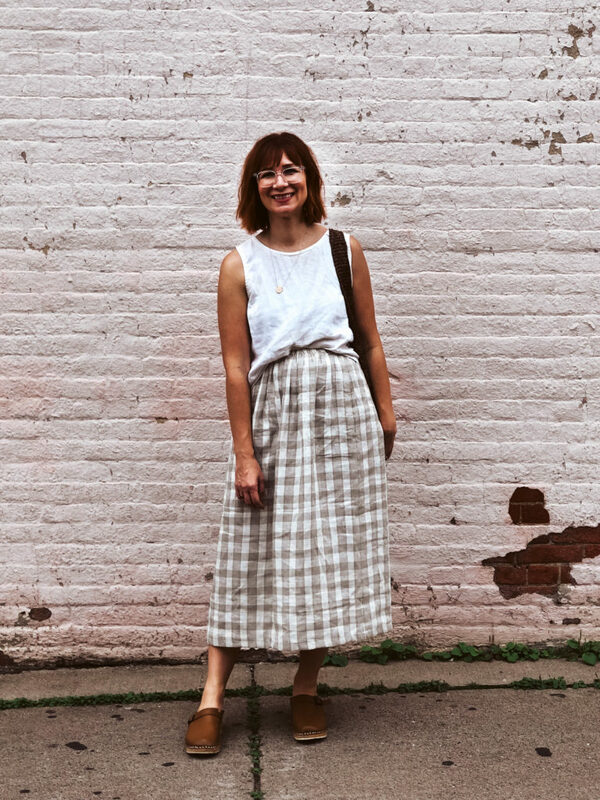 I’ve had this linen for awhile (it was an old table cloth), and I knew I wanted to do something really special with it… but the more I thought about it, the more I realized that I just wanted to turn it into a basic skirt. This skirt is so easy you guys! you literally just sew a yard of fabric together, fold over the top of the skirt (and sew it), and insert some elastic into the fold. This took me about a half hour to make. An extra tip: a wider piece of elastic works best with this style, and it should fit pretty snug in the fold that you make. If you’re not sure how to insert elastic just do a quick YouTube search and you’ll find a ton of tutorials. I loved how it turned out, and I couldn’t wait to wear it! I think it will be really cute with sweaters in the fall! And there you have it! I hope you guys have a great week ahead of you… are you as excited for cooler weather as I am? It’s all a lot of work to navigate. I appreciate your voice and perspective in this! Thanks Rebecca! I feel you on the wardrobe mess. My body is just so much different than it was before, and I’ve basically had to start from scratch, but it’s been a struggle!